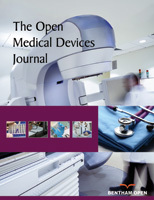 This work presents a study on the procedures for evaluating the quality of imaging display devices in radiology, considering the characteristic luminance curve obtained experimentally versus the Just Noticeable Difference (JND) and the lifetime of digital display devices. The evaluations were done using image patterns published by the American Association of Physicists in Medicine on Digital Imaging and Communication in Medicine (DICOM) and the Grayscale Standard Display Function (GSDF), viewed in DICOM software, with various shades of gray. A digital luximeter was used as the luminance meter. A correlation with the time of use of the devices was performed to classify the digital devices as primary (suitable for medical diagnosis) or secondary (suitable only for visualization of medical images). Among the monitors evaluated, those with a resolution between 2 and 5 megapixels were classified as primary for up to 50, 000 hours of use, and some above that time limit present behavior equivalent to secondary monitors. Monitoring the temporal evolution of the use of devices is important to avoid errors in medical diagnosis. The use of a calibrated digital luximeter with an illuminance unit conversion factor in luminance defined by this equipment was shown to be an alternative to replace a photometer when this latter is not available. Keywords: Quality control, Luminance, DICOM GSDF, JND, Display devices. © 2018 Mesquita et al.